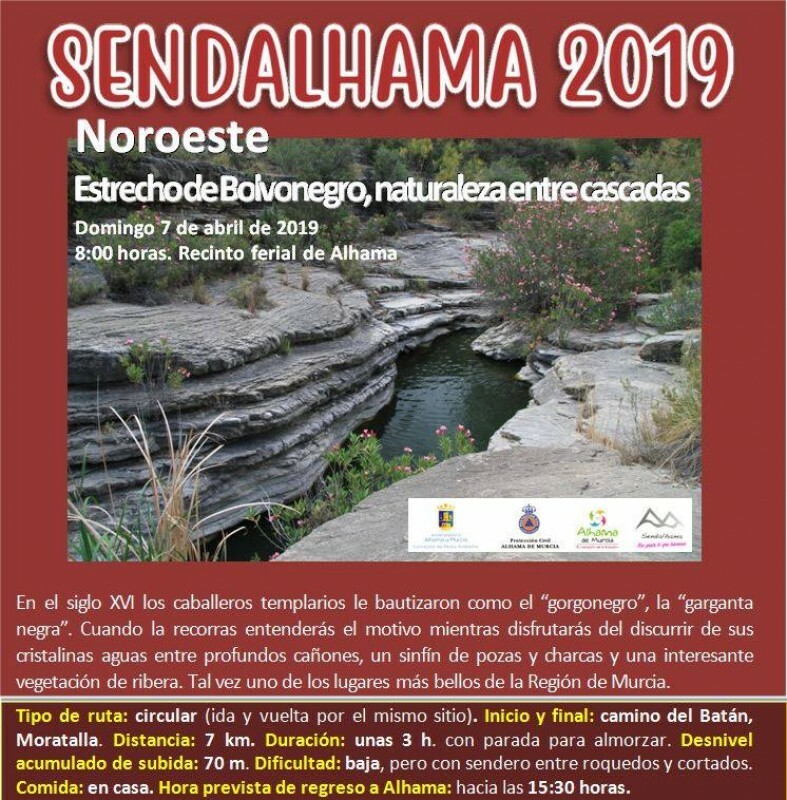 7 kilometres outside the town of Totana, in the wooded foothills of Sierra Espuña, is arguably the most attractive monument in the municipality, and almost certainly the one which is closest to the hearts and traditions of the native Totaneros. This is the complex of buildings which has grown up around the sanctuary and church dedicated to Santa Eulalia de Mérida, a Christian martyr from south-western Spain who was tortured and crucified by the Romans in 304 AD. But it is not immediately obvious how this figure came to be venerated and worshipped in Totana, and in order to understand the connection it is necessary to recall a little local history. The sanctuary of Santa Eulalia de Mérida in Totana dates back to the 13th century, when much of southern Spain (apart from Andalucía) was reconquered by the Christian forces of Castilla and Aragón, who took back vast swathes of the Iberian peninsula which had been ruled by the Moors from northern Africa since the year 711. At the heart of their forces were the Order of Santiago, a military and religious organization who took their name from the patron saint of Spain. These men were warrior knights who had their roots in the crusades protecting pilgrims, and became tremendously powerful supporting the Christian monarchy in its fight to expel the Moors from Spain. In an era when only the rich could afford horses and armour, their support was indispensible and greatly helped to bolster the chances of campaign success. In Murcia they were rewarded for their loyalty to the Crown of Castilla by the reconquering monarchs with land, including Totana and Aledo, where they established a small sanctuary on the site of the present day structure in honour of Santa Eulalia, their own local patron saint in Mérida, where the Order was founded in the late 12th century. The cult of Santa Eulalia declined in popularity during the 14th century, but the sanctuary began to expand in the 16th century after the Moors were finally expelled from Granada in 1492: this meant that western Murcia was no longer “frontier country”, and the general feeling was that it was safe to start building outside fortified structures like the fortress of Aledo. This expansion of the sanctuary coincided with the growth of the town of Totana itself: previously, with defence uppermost in the minds of the local population, the hilltop town of Aledo was the main population centre in the area, but now the residents quickly gravitated down to the fertile farmland of the Guadalentín valley, and before long Totana had become the centre of local administration and commercial activity. Santa Eulalia is the patron of the ill and crippled, and was martyred at the age of twelve after refusing to make offerings to Roman gods. Her executioners tore her to pieces, ripping her body with iron hooks, cutting off her breasts and burning her flesh until she suffocated from the smoke. At the moment of her death a white dove is said to have emerged from her mouth and a miraculous snowfall fell from the air to cover her body. 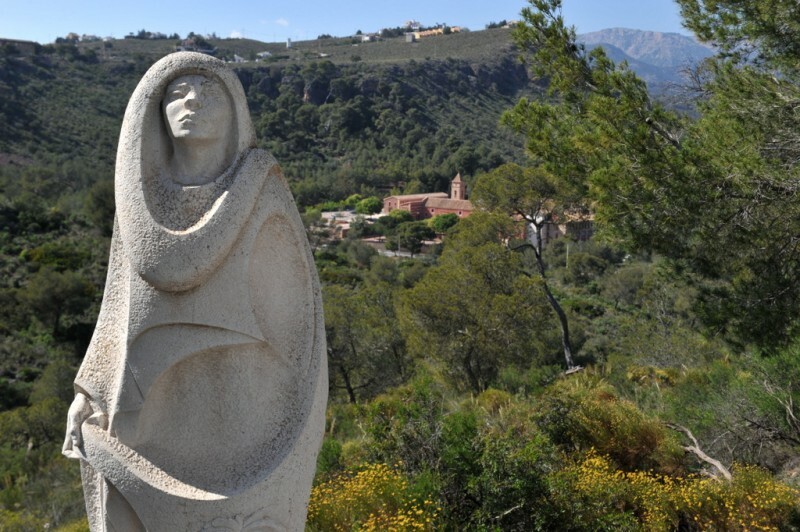 During the 15th century the small sanctuary to Santa Eulalia in the hills between Totana and Aledo was neglected, the only real vestige being the half-forgotten existence of a place of worship. The “concejo”, the regional government of the time, received a report saying that the church had been lived in by a hermit, but even he had been forced to leave “for reasons of war”. However, in the 1490s a lone dweller known as Alonso de Murcia set up home there and made it his duty to offer wine to travelers out of charity. Alonso was followed by a man called Ginés de Arnedo, who decided not to maintain this charitable activity until he was fined for his refusal to do so by the local authorities. This in itself is not of great importance, but it does demonstrate that the Concejo was taking an interest in the sanctuary, and by 1498 there is mention of a building of solid structure “with a nave and strong walls, a good wooden roof and solid plasterwork, as well as good gates and an iron lock”: gradually, this led to an increase in devotion to the saint among the local population over the following century. In the 17th and 18th centuries the complex of buildings grew as accommodation was created for the religious authorities. Between 1662 and 1693 the Sala del Concejo and the Sala del Clero were added, both of them still in use during the annual Romería, while the sacristy dates from 1736 and the porch from the following year. In 1812 the church itself was enlarged to include a baroque camarin: this is a shrine above and behind the main altar, and it is where the figure of Santa Eulalia is housed for most of the year, except between 8th December and 7th January, when she is carried down into Totana for the annual fiestas and Romería which bear her name. However, it was not until 1878 that the main door was created and the tower was built, complete with a clock, and further reforms were carried out early in the 20th century. 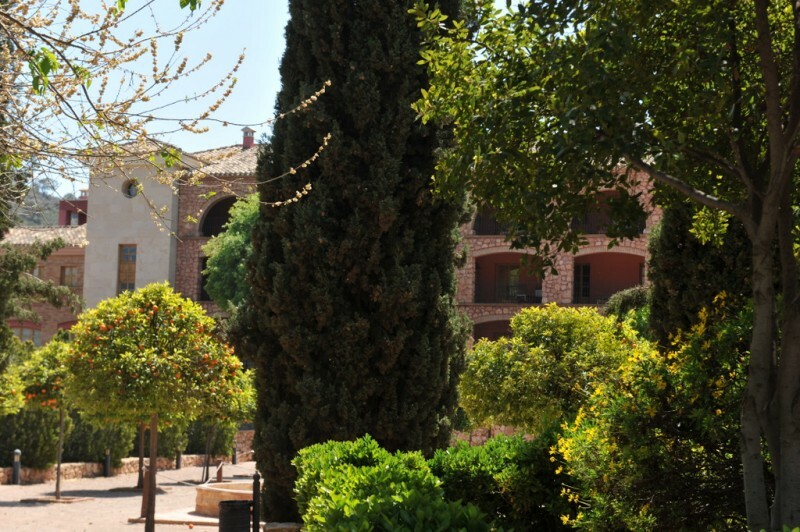 Nowadays, the sanctuary, popularly known simply as “La Santa”, is visited by the locals from Totana and Aledo all year round, and the complex has grown to include numerous outbuildings, all of them blending in attractively with the spectacular countryside in the foothills of Sierra Espuña. These buildings are far from uniform in their age and architectural styles, but they are all built using the same colour of stone and other materials, giving them a pinkish hue which matches the soil of the area. Inside the church 46 images depicting scenes from the martyrdom of Santa Eulalia are distributed over an area of approximately 200 square metres, and the story is mixed with those of the death and resurrection of Christ, the life of San Francisco and other episodes in the lives of some of the best known saints. The wealth of images, apart from the beauty of the location, is one of the main attractions of this unusual church, and the 17th century paintings, which were restored in 2002, are exceptional both in their subject matter and in the sheer number and size of them. 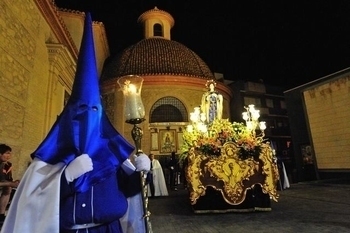 They are said to be without parallel anywhere in the Mediterranean areas of Spain. 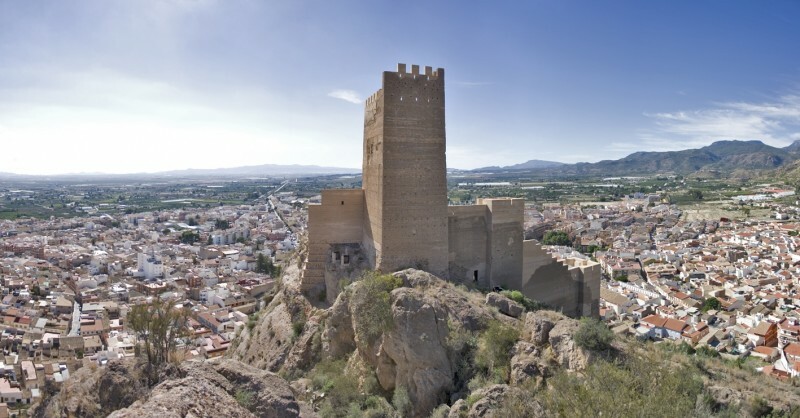 But apart from the images and the surrounding countryside, if the church is one of the most important elements of the artistic heritage of the Region of Murcia it is also due to the baroque altarpiece (created by Jerónimo Caballero Tocino in 1718 and painted by Silvestre Martínez Teruel 14 years later), and the Mudéjar coffered ceiling: this is a smaller-scale reproduction of the one in the church of Santiago in Totana, and was built in 1595, twenty years after the rest of the church was constructed. 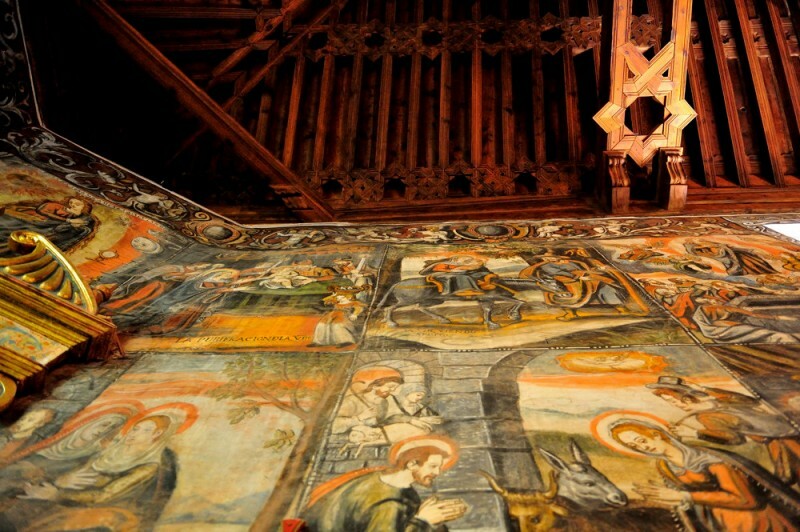 It was probably a copy of work by other master carpenters, since by that time it is almost certain that Esteban Riberón, the man in charge of the construction of the church in Totana, had passed away. It consists of a rectangular framework of rafters and tie beams, all four sides having the same degree of slope, but when the main chapel was added the beam on that side must have been removed. Otherwise, in architectural terms it seems that the 16th century church has not been altered much since its construction. However, the feeling of interior space has been radically altered by the addition of the last part of the church, an independent unit of the building which considerably lengthens the nave. Another reason for the popularity of “La Santa” among the local population is that it now stands in designated beauty spot of 279 hectares, populated mostly by Aleppo pine trees and a wide variety of native plant species. 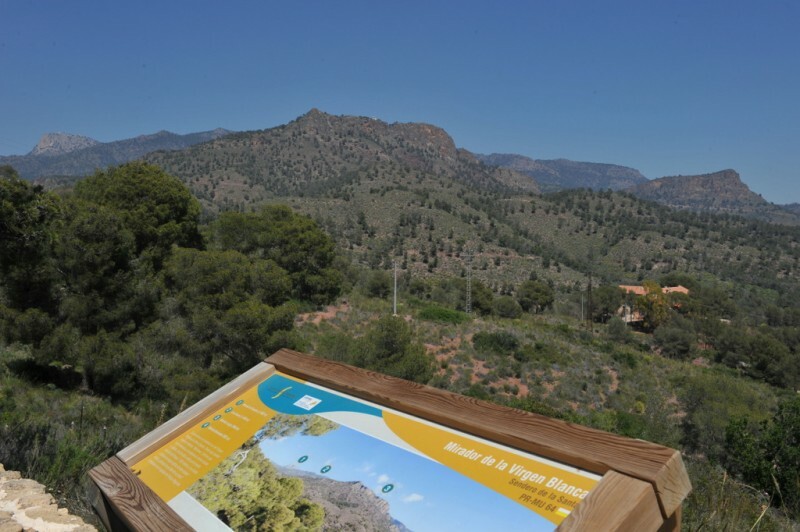 Two recreational areas have been created (El Grifo and El Ángel), and a stroll to the Mirador de la Virgen Blanca viewing point behind the sanctuary is a popular option among the many walking routes on offer. The route up to the sanctuary from the town of Totana is a picturesque one along the RM-502, which is joined from the town centre by Avenida de Santa Eulalia. 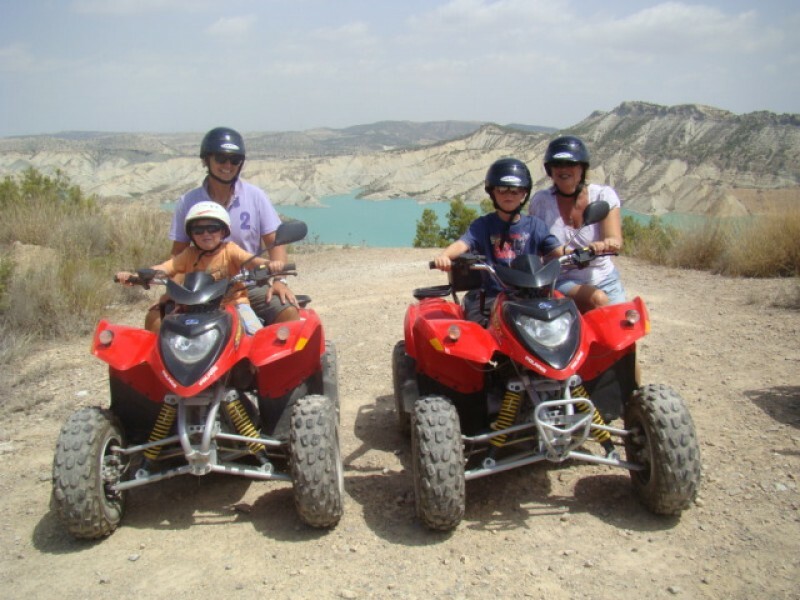 The 7-kilometre drive heads up through the lower slopes of the mountains, which are dotted with attractive country properties, into the thick pine forests of the Sierra Espuña before reaching the sanctuary. Click for map location. 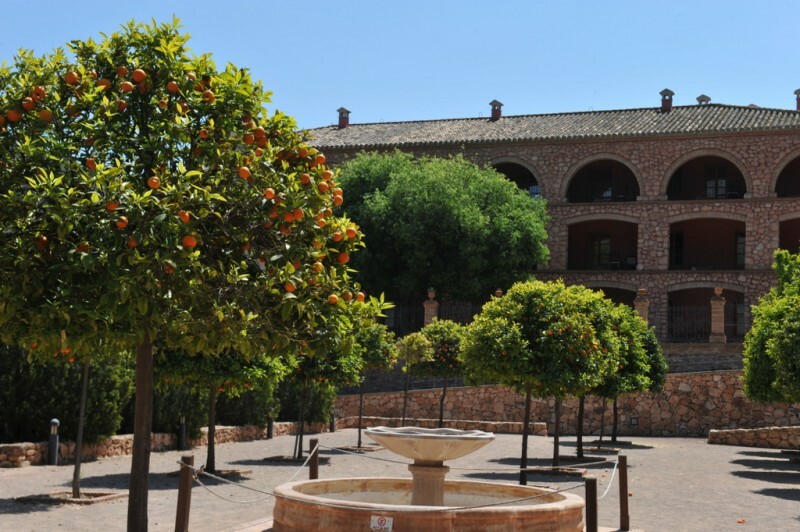 Most visitors will find it rewarding to combine a trip to the sanctuary with a visit to the town of Aledo, where the spectacular views from the old fortress can extend as far as the Mediterranean coast on a clear day, and of course another option is to continue up into the higher ground of Sierra Espuña, which reaches a maximum altitude of 1,585 metres above sea level.